Are you looking for a durable, comfortable and stylish drawstring bag for your active lifestyle? Then Tosun Gym Sack Bag would be a perfect choice for you! The drawstring backpack is extremely light and fits perfectly and perfectly to every occasion. The surface material is honeycomb nylon, it is waterproof and durable. Large capacity to contains clothes, sneakers, towel, water bottles and socks etc. The inner bag is perfect to put the valuables such as cell phone, keys or wallet ect. The drawstring backpack is lightweight, you can fold it up very quickly pack in the suitcase without taking up too much space or weight. Easy to clean. Use this gym bag for storage of any sports equipment such as a fitness towel or camping towel etc. Ideal for shopping, swimming, camping, running, jogging. 1. Pleae note that only the surface material is waterproof, the back material is mesh that not water resistance. 2. The sackpack bag can not hold the basketball. 【LARGE CAPACITY】: Main bag size is 13.8*17.4in (35*44 cm), large enough to fit a size 5 soccer ball. This sports drawstring bag is perfect for sports, outdoor activities, yoga, shopping and school etc. 【MULTI POCKETS】: The front zipper pocket and small inner pocket are good for holding valuable items. They will help you to keep the things separated and easy to be found. 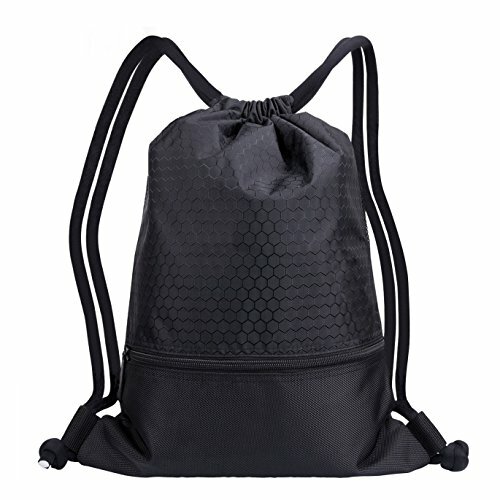 【LIGHTWEIGHT & DURABLE MATERIAL】: The drawstring bag is made of tear resistance nylon, the surface is waterproof. The back is two-layer dense mesh material, breathable and comfortable. 【STRONG & DURABLE】: The adjustable ropes are filled with ultra-thick cotton to protect your shoulder from hurt, even the bag is full. 【100% SATISFACTION GUARANTEE】: We will provide full refund or replacement without reason if you are not satisfied with our drawstring sport bag. If you have any questions about this product by Tosun, contact us by completing and submitting the form below. If you are looking for a specif part number, please include it with your message.